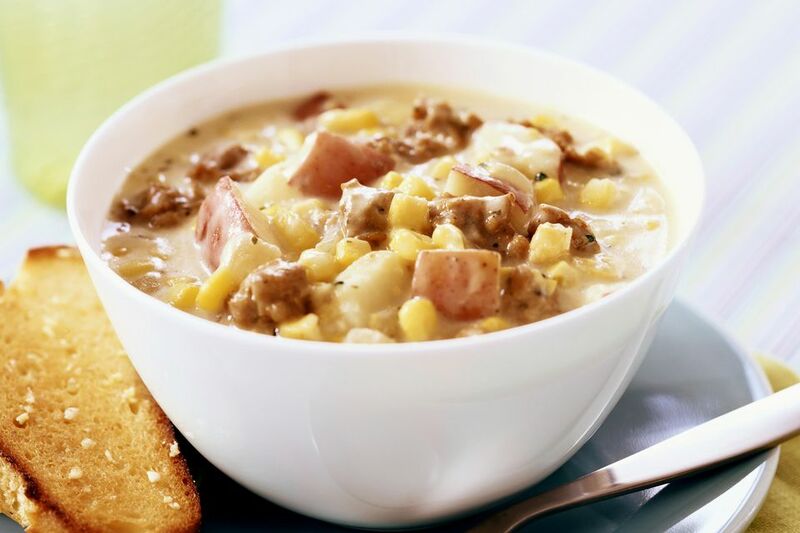 This unique crock pot beef chowder is made with beef broth, ground beef, and cream-style corn. Top each serving of this tasty chowder with shredded cheese and serve with crusty bread. If you prefer a dairy-free chowder, omit the cheese and garnish bowls with chopped green onions, parsley, or cooked crumbled bacon. In a large skillet over medium heat, brown the ground beef with the onion until the beef is no longer pink. Drain thoroughly. Transfer the beef and onions to the slow cooker. Add the diced potatoes, corn, beef broth, water, salt, basil, and pepper. Top each serving with a few tablespoons of shredded cheese. Before you cook the ground beef, dice 4 to 6 strips of bacon and cook in a large skillet over medium heat until not quite crisp. Drain well and add to the slow cooker. Wipe the skillet out before you cook the ground beef and onions. Garnish with thinly sliced green onions or chopped fresh parsley. Add diced carrots or diced pimiento to the chowder for extra color and flavor.